The best air beds offer either an alternative to sleeping on a regular bed or a way where you can be comfortable when you’re away from home. These are versatile sleeping arrangements that can be used on a temporary basis or for something more permanent. Our reviews here focus on the different products that will help you sleep better whether you plan to use the air mattress for everyday use or only when you go out camping. We also cover different sizes of air beds, so you’ll be able find something suited for single sleepers or two people. To help you quickly know that each product is, we’ve included the size, dimensions, weight capacity and height of each of the mattresses below. This way you can quickly find the style you need. Max. Weight Supported: 500 lbs. Best Air Bed: Our top pick when it comes to this category of sleeping products is this Dream Series unit from SoundAsleep. This bed offers the combination of support and comfort to help you sleep like you’re on a regular bed. To do this it uses its very own ComfortCoil Technology where they’ve devised 40 top air coils inside it. This gives you the feel like you’re sleeping on a box spring instead of an air mattress. The size, weight capacity and coil technology make it ideal for sleeping on your own or for couples. The unit is a fully inflatable/deflatable device that can be folded down and fitted into a carry bag. This makes it ideal for both at home or outdoor use. For convenience, it comes with its own built in air pump. The pumping system fills the entire bed with air in less than 4 minutes. It also allows you to manually adjust the firmness of the surface you’re sleeping own to your liking. The product is constructed with 15 gauge puncture resistant material making it durable as well as resistant. Max. Weight Supported (Queen): 500 lbs. Max. Weight Supported (Twin): 350 lbs. Versatile and Lots of Features and Options: If you want to have a lot of different options when choosing your air bed, this one gives to you. This product is offered in both queen and twin sizes. Please see the dimensions and weight capacity above. Both have the same heights at 18” tall keeping you high enough from the ground to make it easy to sit down on as well as get on or off the bed. What makes this air bed unique is the NeverFLAT pump. This technology is built into the mattress to give you the convenience of being able to not need an external pump. These are pre-set pressure settings that will let you get the firmness you want automatically. As such you get the option of estimating the firmness yourself using the inflate/deflate switches, or just let the pre-set firmness do it for you. This gives you ultimate adjustability. It includes a second pump which acts to monitor and maintain the pressure. The second pumping system is just right beside the primary pump controls on the side of the bed. This secondary control continuously monitors the internal pressure. When its sensors detect that there isn’t enough pressure it will add to it to get the desired firmness. Max. Weight Supported: 600 lbs. Cheapest Air Bed: At under $20, this is among the least expensive airbeds available. It is a great way to add extra sleeping space whether at home or when you travel. Its size also makes it ideal for bringing on camping trips as well as making it easy to carry it between rooms. When packed down, it weighs under 10 lbs. and measures 14.5” by 12” and is only 4.38” tall. Once inflated, it expands to its full size. This is a low profile air bed that lets you sleep closer to the ground. It is offered in the queen size that’s long enough even for taller individuals as the length goes all the way to 80” which is 6’8” long. At under 9” high, this is ideal for individuals who like to sleep on the ground but have enough cushioning to make it more comfortable.. The unit is constructed with 15 gauge vinyl beans that offer support. It also has 16 gauge sides and bottom to make it durable. The top surface is both soft and waterproof so you can relax on it yet not be bothered should it get wet. Please note that this air bed doesn’t come with its own pump, so you need to get one to use with it. Cheap Air Bed (Raised): For budget conscious consumers, this is our pick for best air bed for the money. It costs less than half the price of the raised air mattresses above which makes it something that’s more economical. This mattress has a high weight capacity at 600 pounds giving it the ability to support 2 adults thanks to its build and size. The unit is also resilient and durable thanks to the Fiber-Tech technology the brand uses inside it. This makes the bed adjust to the contours of whoever sleeps on it yet offers better support than regular fibers. This means that over time it doesn’t flatten out and keeps its shape. This Dura-Bean air bed comes with its own built in air pump to save you the hassle of plugging in and unplugging the hose to the bed. The pump also takes care of the deflating duties. During inflation, it takes less than 5 minutes to get the bed to its full size. You can however, adjust the bed to the firmness you want by controlling when the pump stops filling it with air or deflating it a bit should it get too firm. At just over $50, this is a great low cost air bed for home or outdoor use. Sleep is one of the most important things that human body needs. 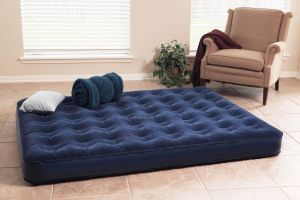 A good air bed offers you an easy, portable and adjustable alternative to regular beds. They can be used every day or just once a month on certain instances. But they do offer a comfortable way to help you get your rest.